The question of how to improve farming to feed and sustain people in developing countries is as important as ever, and there are no easy solutions. One route to finding answers is through the science of agronomy – testing and evaluating how crops and farming techniques perform under different conditions. But, as with any science, there are battles and debates over what works, and even which problems agronomy should be trying to solve. Whose agronomy counts? Is agronomy trying to solve the wrong problems? How can agronomy and the social sciences work together better to understand what happens to the science when it comes into contact with real farmers in the field? 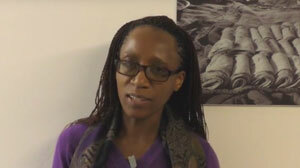 These were some of the key questions asked at the Contested Agronomy conference, which took place on 23-25 February at the Institute of Development Studies (IDS). Contested agronomy: whose agronomy counts? The IFPRI blog features a post reflecting on the conference by David Spielman, Carlo Azzarri and Patrick Ward from IFPRI’s Environment and Production Technology Division. “As researchers working on agricultural development programs in South Asia and Africa, there are a lot of agronomists in our world. Despite being IFPRI economists working on agricultural science and policy issues, a lot of our work hinges on what agronomists do–the technologies, practices, and systems they develop with and for farmers, especially resource-poor farmers in developing countries. We have just finished a fantastic conference co-hosted by the STEPS Centre on ‘Contested Agronomy’ with 80 participants and a vibrant discussion. I was asked to give some comments at the end. Here are some of these thoughts. 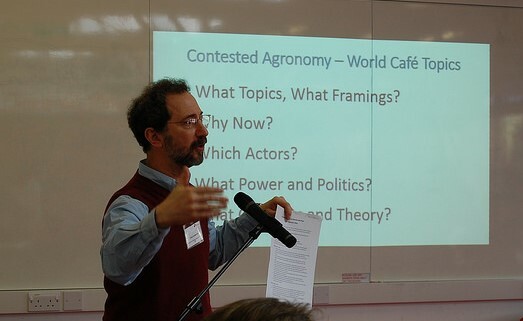 Throughout the conference it was clear that ‘agronomy’ had to be understood both as a technology and practice, which is always connected to social, cultural and political contexts. Agronomy is always mutually constructed, situated and relational. Agronomy is thus a set of socio-technologies and practices, but also hooked into particular social imaginaries and policy narratives. So, in other words, context matters, and technologies (and practices) cannot be separated from this. This much is obvious – and is always the case, and a very basic insight from science and technology studies. Can China and Brazil use their home grown agricultural knowledge, which has driven phenomenal agricultural productivity at home, to transform agriculture in Africa? That was one of many questions discussed at the Contested Agronomy conference. Taking a step back help put this into perspective. Every year thousands of students are advised that a compelling dissertation or thesis must engage with an important debate. A debate is contention through disciplined argument. It implies a testing of different views or positions, and conceptual, methodological or evidential tension. And academic engagement suggests that the different arguments in the debate are picked apart and weighed, that evidence and counter-evidence is analysed critically, and that something new – in terms of theory, concepts, evidence or analysis – emerges from this process. In principle it is through the dynamics of debate and engagement that new ideas about complex questions or problems are generated and scientific knowledge is advanced. 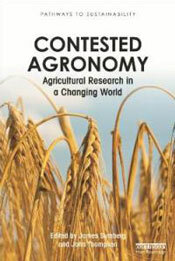 From this perspective, lively debate and vigorous contestation are at the centre of agronomic knowledge production. It is argument and open and critical scrutiny of ideas and evidence which elevates agronomy to a science. We are not therefore in the least concerned by debate, argument or contestation, as these are nothing more or less than the signs of a healthy discipline. After all, who could possibly be enthusiastic about a world of uncontested, consensual, neutral or plain vanilla agronomy? Has the ‘impact agenda’ helped agronomy – or harmed it? Every agronomist or agricultural research institute with an interest in international development, and who has applied for a research grant in the last 15 years, will have had to develop and justify a theory of change, and identify outcomes, anticipated impacts, measurable indicators and impact pathways. These tasks have become an obligatory part of agricultural research design and planning. The resulting theories, claims, indicators and pathways are supposed to be useful in assessing, monitoring, reporting on and evaluating the research investment. First, where did research funders’ interest in theory of change and impact pathways come from? Second, what is the evidence that the focus on them has improved the quality (or relevance, productivity, effectiveness, or any other dimension) of agronomic research? And third, what unanticipated consequences might this focus be having on the culture of publically funded, development-oriented agronomic research? Each of these questions warrants careful consideration, and would provide starting points for fascinating PhD research. While we wait for these PhDs candidates to come forward, some initial thoughts and speculation will have to suffice. Sign up to receive updates from the conference by email.